The Blue Bonnet Retreat classes for next February 2020 are up on their website. There are a variety of types of needlework taught so explore a little and see if anything catches your eye. © Copyright February 25, 2019 Jane M. Wood. All rights reserved. This is the sixth year in a row at the Fort Worth's Thistle Hill Mansion has had the A Needlepoint Love Story exhibit on display for three days in February. Ada Hayden of EyeCandy has been helping and designed the commemorative ornament and the class project for the event. I think a few extra commemorative kits are available locally, but check with Fort Worth's French Knot for help. © Copyright February 26, 2019 Jane M. Wood. All rights reserved. 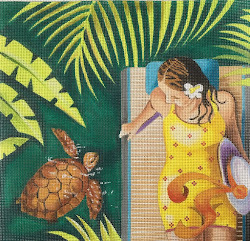 The British needlepoint designer and teacher Anna Pearson has been rather busy! She's exploring what she calls shadow stitching, which we in the USA usually call light coverage needlepoint. Her retreats sound lovely and I bet her classes are, too. I do find it fascinating that she's starting to work light coverage stitches on painted canvas, much as many Americans do. That's not generally the British needlepoint style. Keep up the good work, Anna! 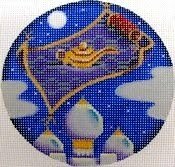 We need lots of choices to attract the broadest audience to the world of needlepoint. Freda's Fancy Stitching in Canada just announced a new mystery sampler design is available. Looks like you pay each month to download the lesson. There are 8 parts. Head to Freda's website for more information to participate in this fun mystery class. © Copyright February 22, 2019 Jane M. Wood. All rights reserved. 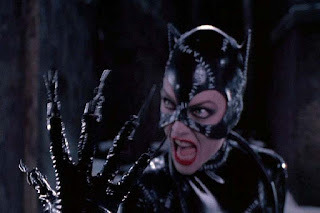 Remember Michelle Pfeiffer as Catwoman in the 1992 film Batman Returns? 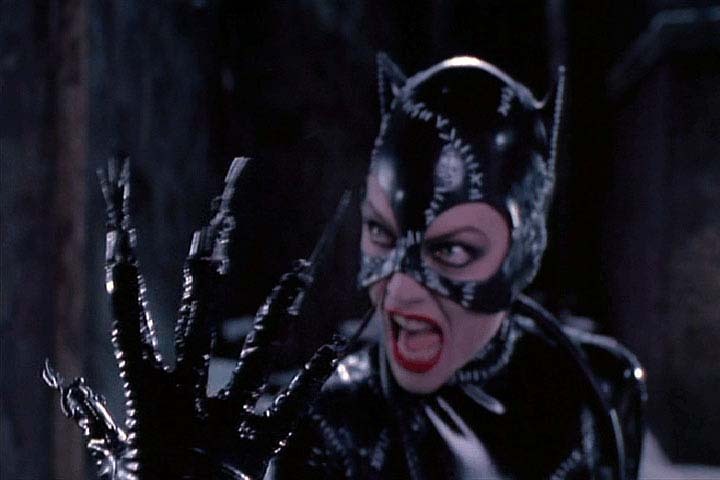 Her claws were trolley needles, modified somewhat by the costume department. And how does this relate to needlepoint? Trolley Needles are laying tools that clip onto a finger—or in my case my left thumb. Needlepoint for Fun's latest e-newsletter talks about using a trolley needle here. See? We can all be movie stars as we stitch! By the way, I've never poked myself with my trolley needle, no matter how long I've worn it during a long stitching session. *Photo courtesy of Catfan's website. © Copyright February 1, 2019 Jane M. Wood. All rights reserved. Labels: cotton, cotton floss, Madeira, Mary Corbet, reviews, threads. 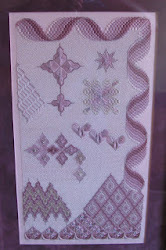 Mary Corbet has been stitching with Madeira's cotton floss and has posted a review on her website. Threadaholics, take note! By the way, Madeira's silk floss is packaged the same way as the cotton embroidery floss. I don't like the stiff feel of their silk but the packaging is genius! Sarah at A Field Guide to Needlework has been creating artwork paying tribute to books. Some of her "books" are woven, some are drawings, some are needlepoint. All are fun to look at. If you were going to create a needlepoint tribute to your favorite book, which one would you choose? © Copyright January 13, 2019 Jane M. Wood. All rights reserved. The New Jersey Needle Artists (NJNA) chapter of ANG did a stitch-a-long last year based on Lorene Salt's "Autumn Kaleidoscope." Not everyone participated but they all had a lovely time. You can see the various color ways on the chapter's website. And if you are going to Woodlawn's exhibit this year, check out Barbara's "Stars for a New Millennium." The chart for Stars and for Autumn Kaleidoscope are available at many shops. These are just the top search results I got. The same shop that has Kaleidoscope also has a kit using the custom threads for this color set, just in case you are interested. Any shop can kit out one of the many color ways Tony has listed in Stars. © Copyright January 30, 2019 Jane M. Wood. All rights reserved. Fans of Libby Sturdy's Just Libby canvases will be interested to hear what she designed for the Governor's Mansion in Springfield, Illinois. UPDATE: Just realized I forgot to add a link to Libby's website so folks who are new to her designs can have fun browsing. Some of Libby's designs are painted, some are line drawings with instructions on how to fill in each section with stitches. A few designs are available either way. All are fun and fabulous! Threads Across the Web just posted some of the Japanese Embroidery designs she's stitched with cherry blossom motifs on them. I had no idea that you always stitch the foreground items first in Japanese Embroidery, or that the cherry blossoms are also stitched in a specific order. Thanks for this interesting and thought-provoking article, Carol-Anne! I almost always stitch my background first—and I have never stitched flower petals in any specific order—so this gives me food for thought. Need a reason to stitch? It's good for you! © Copyright January 8, 2019 Jane M. Wood. All rights reserved. You don't see needlepoint boots much. These are all lovely! The owner of this Etsy shop also creates regular slippers, shoes, half boots and purses, many of which are needlepoint. © Copyright January 24, 2019 Jane M. Wood. All rights reserved. Brenda has organized her stretcher bars to make the right size pairs easy to find using an old liquor bottle box. If you buy wine by the case, save the box to use this way. Or get a wine-drinking friend or your favorite restaurant to save an empty box for you. © Copyright January 27, 2019 Jane M. Wood. All rights reserved. The ANG Online Auction Starts Tomorrow! I grabbed this description of how it all works from the ANG Auction chair's post on Facebook. "What happens in February? ANG Auction, that’s what! Once again, ANG will launch its Online Auction- this year it begins February 17 at 8:00 AM CT and ends February 24 at 10:00 PM CT.
We have belts, books, rugs, canvases, finished items, charts – did I mention belts? We have it all! Anyone can bid! You don’t have to be a member of ANG (of course we would love it if you were)! Just go to ang.afrogs.org to start your shopping list. If you have bid in the past, your auction login is the same. If you are new to this, register and start shopping! All proceeds go to support ANG and its mission to preserve the art of needlepoint through education. Don’t miss out on this stash enhancement opportunity!" Do you have trouble understanding basketweave and how the stitches are done? Ashley's husband created this great visual aid for a class she's teaching about how to do the stitch. VERY clever! Santa brought me a copy of Ruth Schmuff's latest book, iStitches Volume Five, for Christmas and I've been dipping into it when I have time. Ruth has five other books, iStitches Volumes 1-4 and Backgrounds Volume 1. I own them all in one format or another and use them frequently. They are all available from Bedecked and Beadazzled. Note the varying formats. The three earliest books are available on CDs or as hard copy spiral bound books. All of the iStitches series are available in two book formats: travel size (5 1/2 x 8 1/2) or regular (8 1/2 x 11). You can also buy a digital version of all the iStitches series in both iOS and Android flavors except for iStitches 5 which won't be available until the spring as a digital download. All are packed with stitch diagrams. I own iStitches 5 in the travel size. This is the first time I've seen the travel size format in person. It's really handy for those who are on the road a lot. You can pop the book in your tote bag, suitcase, glovebox or purse. Like the other books, it is spiral bound with a heavy plastic front and back cover for protection. The book is 307 pages long, which includes the Table of Contents and a three page index. The book is divided into stitch types to make finding what you need easier: Diagonal Stitches, Straight Stitches, Crossed and Tied Stitches, Eye Stitches, Darning Patterns, Laid Fillings, Blackwork Patterns and Decorative Stitches. 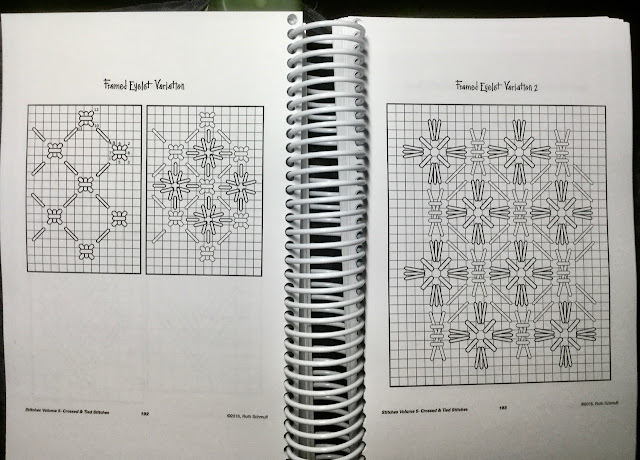 There is one stitch diagrammed per page but some stitches are complex enough that there might be as many as three diagrams on one page so you can easily follow the various steps. All the diagrams are in black and white and gray. Most are numbered so you can follow the stitch path easily. 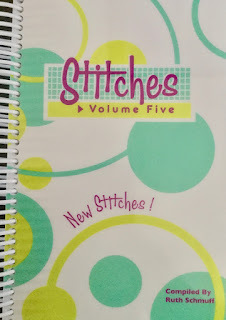 As far as I can tell, none of the stitches in iStitches 5 are in Ruth's other books. There are a lot of variations on a stitch presented, which comes in handy when you want to unify a design by using several similar stitches in various places. Some stitches are repeated in chapters if they can be classified many ways. One is in four different chapters! Quite a few occur twice. 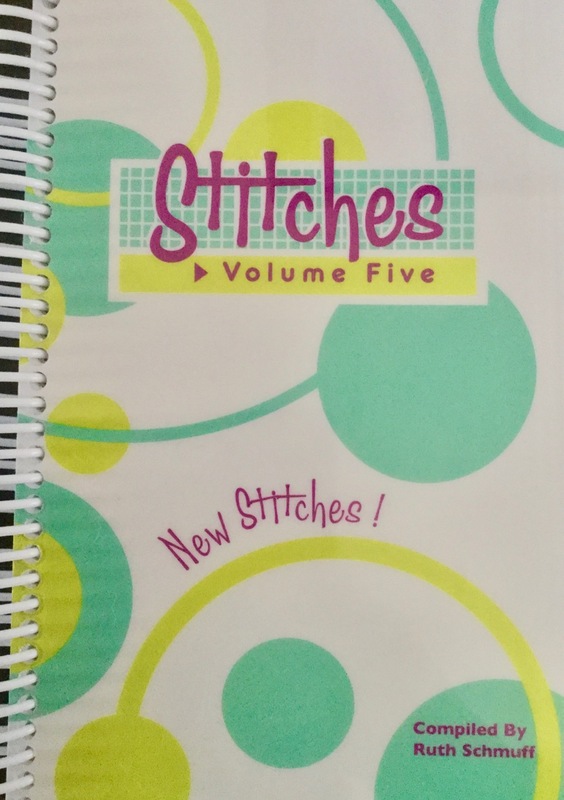 But you still have a reference book of nearly 300 stitches to choose from. Ruth is a master of light coverage stitching, and many of the blackwork and darning stitch patterns are perfect for this type of stitching. However, you can easily basketweave an area, then put a darning or blackwork pattern on top if you are careful to use less thread than usual for the bottom layer and use a sharp needle for the top layer to easy the stitches through. You can also fill in open stitch areas with brick stitch or tent stitches to create a denser look. In other words, this book is useful for those who prefer full coverage if you exercise a little ingenuity when it comes to the more open stitches. The only drawback I see for the book is that the travel size index is hard to read without my reading glasses and the numbers in the diagrams are pretty tiny, too. If you have vision problems, the regular size of iStitches Vol. 5 is probably a better bet. The diagrams are perfectly clear in the travel size, though. This is a book I highly recommend and I know I'll use it as frequently as I use Ruth's other books quite a lot, especially the digital versions which I find very easy to flip through looking for ideas. For more information, check Sheena's blog to read her take on iStitches 5. Ruth Schmuff used corkscrew stitch to make twisted cord for her last embellishment class. You can use this for curls, beards, or just a raised line on your painted canvas. Thanks, Ruth! It's a great video! © Copyright 2019 Jane M. Wood. All rights reserved. Linda and her husband took all the New Jersey Needle Artists' pieces to Woodlawn Plantation to put them in the exhibit. It starts today, March 1st. Hope you get to go! © Copyright February 12, 2019 Jane M. Wood. All rights reserved. Sue at the Tortoise Loft came across a pair of magnifiers really cheap and decided to try them. And she likes them a lot! She doesn't think they'll work for everyone and explains why on her blog, but it's certainly useful to see what she thinks about using them for stitching. Note that the link Sue provides is to a UK company's website. I couldn't find them available in the USA. © Copyright January 22, 2019 Jane M. Wood. All rights reserved. Various cities are setting up what is called Stitch Club in their areas on Instagram. Stitch Club's Instagram page has logos for each city that currently has a club going on. Right now it appears that each city picks a small canvas to stitch together or gets together to stitch periodically. I don't have time to add another social group to my day so I don't have a lot of information beyond what Don has posted above. Send inquires to stitchclubofficial@gmail.com. UPDATE: Here is an interview with Alexandra Martin, co-founder of the Stitch Club movement. It looks like the Woodlawn Plantation has revved up their motors and scheduled a slew of lectures during the Needlework Show in March 2019. Click on the various lectures to get a description and find out the day and time it will be offered. Remember, the show is March 1-31, except they are closed on Tuesdays. Admission is $15. I believe most of the lectures are free but you'll need a ticket or to RSVP in some way. © Copyright February 7, 2019 Jane M. Wood. All rights reserved. Kimberly often mounts her original needlepoint designs in shadow boxes with a beaded edge. She reveals all in this very useful tutorial that explains just how she does it. Did you use Ghost Stitchers, the update New York stitching service that closed unexpectedly in the late summer of 2013 when the co-owner died? I wrote about this last year and this weekend one of the ghost stitchers turned up with a project they would like to return to their owner. It is a counted cross stitch project from Sunset. The client id is 9865 and the project number is 50008. If this is yours, let me know by commenting here or email me at chillyhollow at hot mail dot com. The ghost stitcher would like to return the project but they don't know who owns it. Spread the word, ok? Thanks. UPDATE: The owner of Project 50008 has surfaced so if you have this project, please let Sheila at solsufka@xplornet.ca know. © Copyright October 25, 2014 Jane M. Wood. All rights reserved. I have to admit I've never seen anything like this! The finisher who created this is Vikki's Stuff. Here is her website. I didn't find the corset there, sadly. Many thanks to Bettie for spotting this and for Cynthia who knew the finisher who created it. © Copyright January 20, 2019 Jane M. Wood. All rights reserved. Cecilia found a list of the old Paternayan colors converted to the newer numbers online. I don't know if the "new" numbers are those that are available now or not. I'm waiting to hear from Cecilia where she found this information online. Brighttech is a new brand of light/magnifier on the market. They sell floor and table models and light/magnifiers that clamp onto a desk or table. There is a five year warranty on the ones I looked at, but these are LED lights. I don't think if they burn out the lights can be replaced. © Copyright January 11, 2019 Jane M. Wood. All rights reserved. Sajou recently sent Mary Corbet a pair of their embroidery scissors for review. These are beautiful delicate scissors, more for occasional use and display than everyday embroidery scissors. Mine are simply gorgeous. 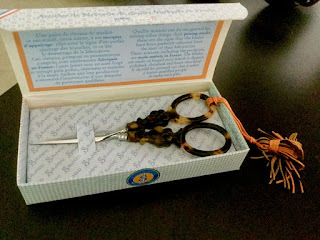 I haven't used them yet (they were a gift from a dear friend) but I love opening the box and sitting it on the table to look at while I stitch. They make me feel glamorous and skilled and give me much pleasure. If you love beautiful things, these might be the scissors for you. © Copyright November 6, 2018 Jane M. Wood. All rights reserved.